Phoenix, Arizona – September 27, 2004 – The Stevie Awards for Women Entrepreneurs, www.stevieawards/women , is a new national awards competition recognizing the accomplishments of women small business owners in the United States. The awards are produced by the creators of the prestigious American Business Awards, hailed as “the business world’s own Oscars” by the New York Post (September 22, 2002). More than 600 nominations from small companies in virtually every industry were submitted for consideration in 18 categories, including Best Entrepreneur, Best Young Entrepreneur, Best New Product and Mentor of the Year. Ms. Koerber-Walker was named as a finalist in the category for Best Entrepreneur – Service Business. Ms. Koerber-Walker is the founder and chief executive of CorePurpose, Inc. a consulting and services company based out of Phoenix Arizona. Since its launch in July of 2002, CorePurpose® has been dedicated to providing services and solutions that build businesses. The company has 3 divisions, CorePurpose Publishing, CorePurpose Consulting and The CoreAlliance, its network of over 40 independent services organizations which include thought leaders in the areas of People, Sales and Marketing, Operations, Finance and IT. In addition to her role as executive director and CEO, Ms. Koerber-Walker is a Professional Member of the National Speakers Association, and the author of Working: A Management Tale of Changing Relationships in Changing Times (CorePurpose Publishing – ISBN 0974705608) and co-author of Connecting Resources: A Primer for Electronics Distribution (Thomson Learning – ISBN0759332495). She also serves on the Board of Directors of the Arizona Technology Council and on advisory boards to the W.P. Carey Executive MBA Program at Arizona State University, The Thomas and Joan Read Center at Texas A&M University, and Parenting Arizona, an affiliate of CPLC. The Stevie Awards for Women Entrepreneurs are governed by a board of Distinguished Judges & Advisors that features many leading women entrepreneurs and figures in American business, including Carrie Fitzmaurice, publisher for Entrepreneur Media Inc.; Dr. Lisa Krinsky, chairman & president for SFBC International; and Dr. Betty Spence, president of The National Association for Female Executives. The elegant Stevie trophy was designed by R. S. Owens, the same company that makes the Oscar and the Emmy. 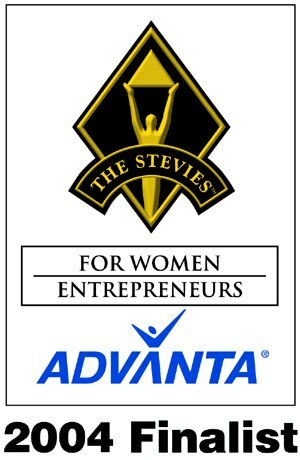 Details about The Stevie Awards for Women Entrepreneurs and the full list of Finalists are available at http://www.stevieawards.com/women/. CorePurpose is a registered service mark of CorePurpose, Inc. Hailed as “the business world’s own Oscars” by the New York Post (September 22, 2002), Stevie Awards are conferred in three programs: The American Business Awards, The International Business Awards, and The Stevie Awards for Women Entrepreneurs. Honoring companies of all types and sizes and the people behind them, the Stevies recognize outstanding performances in the workplace worldwide. Learn more about The Stevie Awards at www.stevieawards.com. Posted in Company News, News and tagged Joan Koerber-Walker, Stevie Awards 2004.